Meet Stan the Stegosaurus. 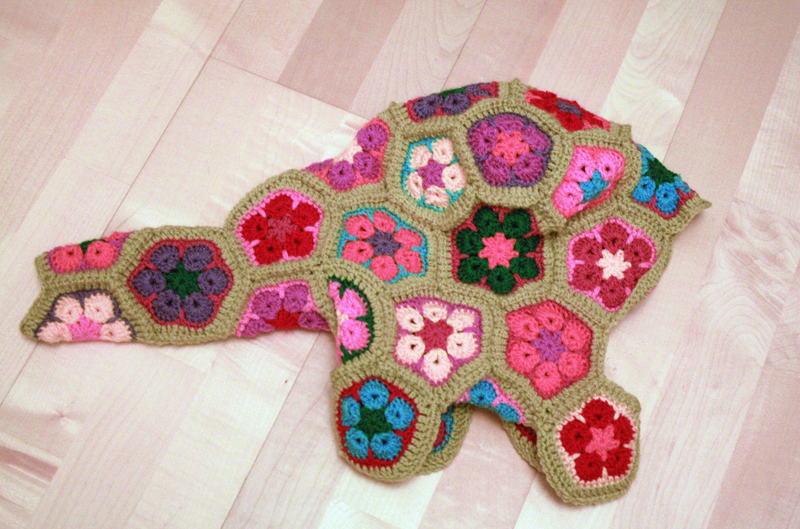 Yes this is unmistakeable as another pattern from Heidi Bears design catalogue. 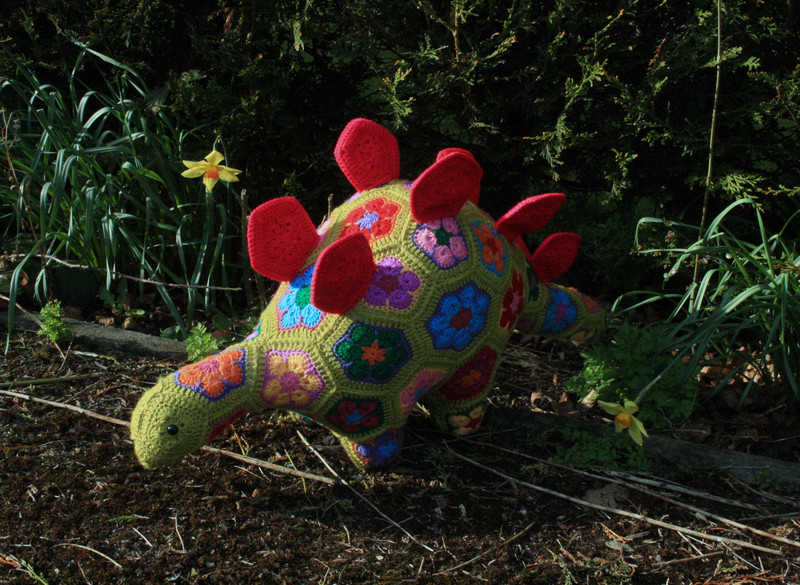 The making up part of the Stegosaurus pattern is different from the Bluebird of Happinness, you make the outer edge of each hexagon as you put him together. It took me a while to appreciate quite how this would work, but neverthelesss I set to and made all the flowers. It was very satisfying sitting with all the lovely colours in a neat row like little soldiers whilst I worked down the line selecting each colour in turn to create the flower centres ready to create my historic creature. It has to be said, the pattern is huge, I started to print it out and the pages just kept on coming off the printer, I started to wonder if I had asked the printer for several copies! Eventually it stopped and I browsed through the umpteen pages feeling more daunted by the page! But don’t be put off, this story has a happy ending as you can see. 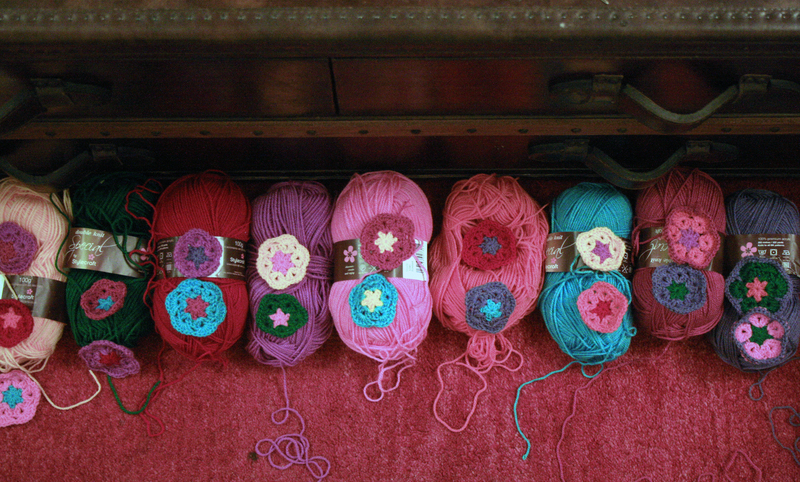 Once I got started it was so easy to follow, it takes you step by step with great photo tutorials for every hexie you join. Starting with the tail………..
………………… finally the neck and head. Then once the body is completed you make the spikes for along his back. 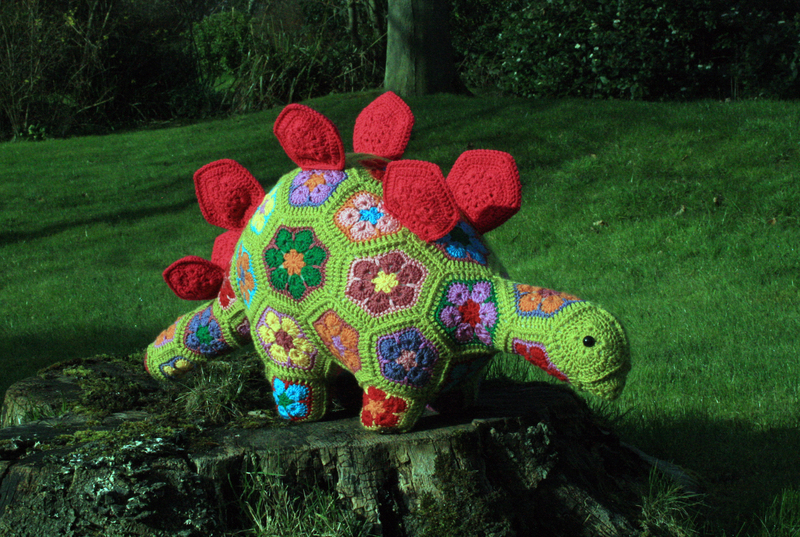 Once fully assembled Stan the steg took a little break on the stool before heading out for a forage in the garden. Oh my, this is so cool! Thank you, I appreciate your kind comment. I felt exactly the same about the volume of pages but as I have said I think once you get going it will all make sense. Good luck, I can’t wait to see him. Happy to hear little Mudlet likes him, you can add it to your list of to do’s. That is if you are a good girl little Miss M.
So awesome and expertly made! Thanks, but if I took a few close ups you may have to change that statement? It took a bit of getting used to how the joining as you go method worked, as always I think if I make another it will be neater and tighter. Lol, well you hid the mistakes well, or happy accidents to make the Stegosaurus truly yours. Wow, this is just brilliant and I love the colour combinations you’ve used! Thanks, picking the colours is always my favourite part. Wow, I am so pleased to hear that and look forward to reading all about it, I hope you are going to do a post? That is about as cute as it gets. I love that you took him outside for a dinosauric forest-like environment. Years ago, I had three blue brontosaurus beanbags for juggling, collectively known as the Bronto sisters. 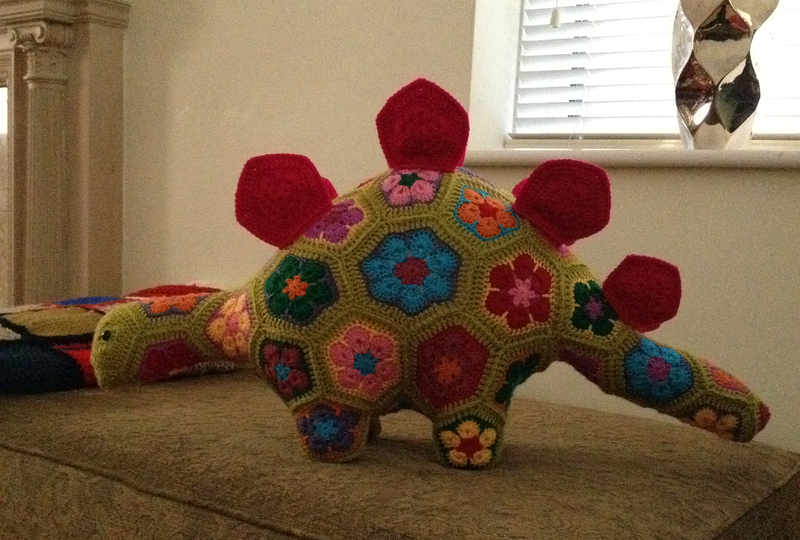 I may have to make another set of them, having seen your stegosaurus! Love the sound of the Bronto Sisters, I haven’t juggled for years, not even sure I could do it now! Were they crocheted? No, they were cotton twill. I think the next ones will be felt. Maybe I’ll give them a little back ridge, too. He he, would make them the Steggie Sisters? Yes, but the Steggie is so cute and may need company, hey? Love it!! Those African Flower critters are all cute. Thanks, I think I will make another but can’t decide if I want to make the dragon or the teddy bear. He is absolutely fabulous! A great make. Thanks, he is actually much bigger than I expected and consumed a ton of stuffing though! Get away with you! You can make one for yourself. Just think how proud of yourself you would be. I promise that the pattern is well written step by step which makes it so easy to follow. Yay, I loved Smaug the dragon, love to see him when you have him completed. That is amazing. I’ve seen those designs before and they all look incredible. Thanks, I think people either love or hate them, I think they are so interesting to look at and definitely fun to make. 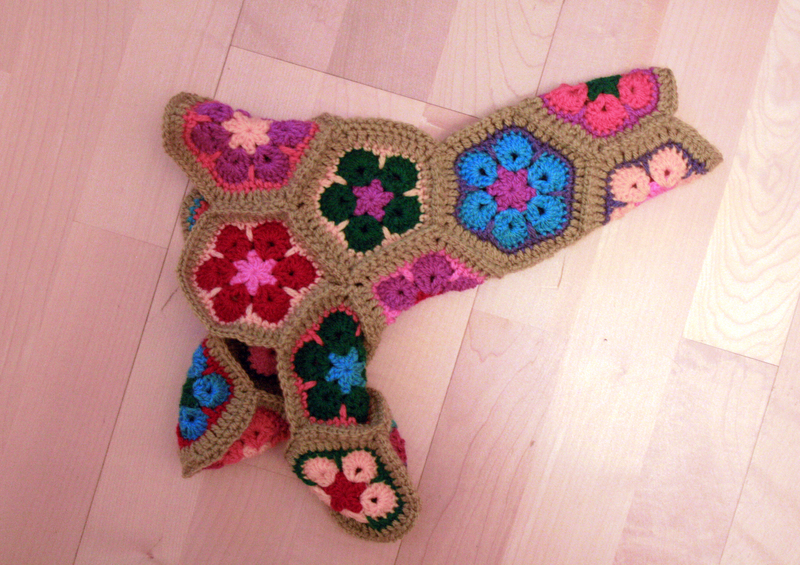 Yeah, I get that granny squares are a love them or hate them thing. Me, I love them. It’s all a matter of personal taste. 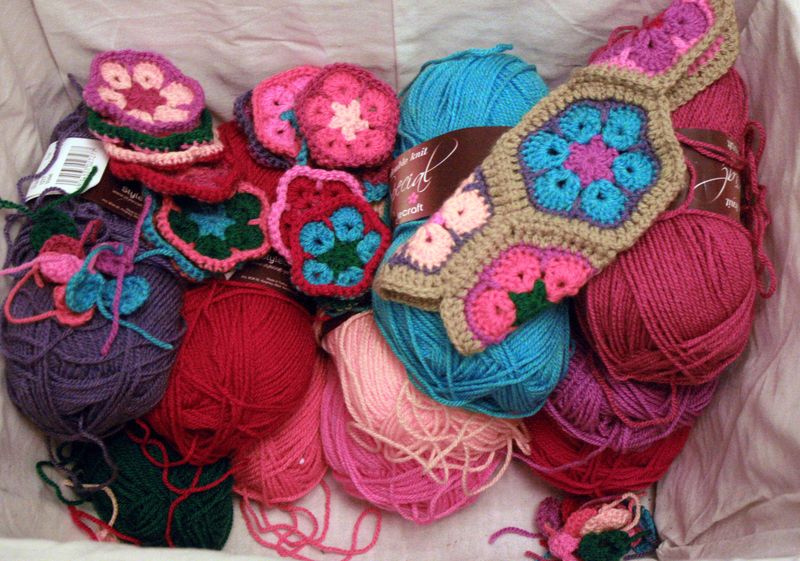 I love the fact that you can use lots of colours with granny squares. Great job – REALLY cute! 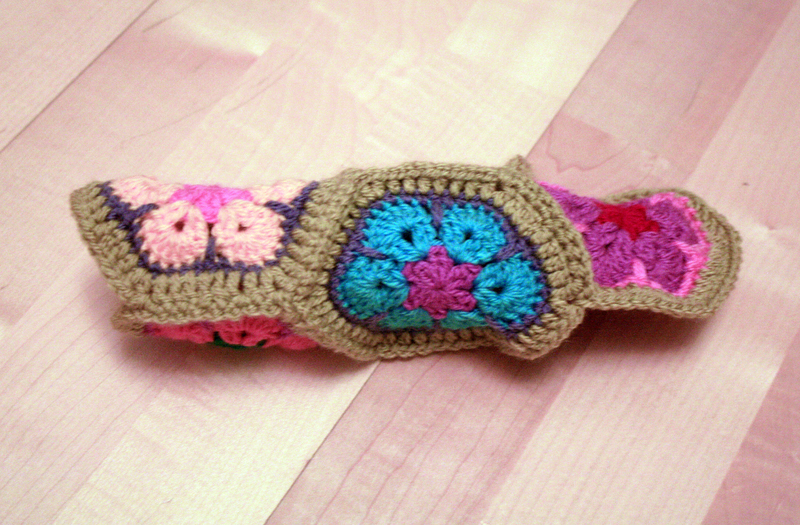 Another ‘crocheted wonder’ from you! Thank you for your lovely comment, I wish I could take more of the credit, the pattern was so detailed it made it so easy to make.